Designed in 1905 by Charles Adams Platt for Henry Howard. This 1869 picture is a good starting point for understanding the history of the Aspinwall house. Oddly, it appears that the house was deliberately designed to have the rear face Aspinwall Ave. In this photo the house still has its extended rear structure and the great elm tree has come down. Aspinwall House is on the far right, erected circa 1660, torn down 1891. Oldest of several photos with the great elm at the rear corner of the house still standing. St. Paul St. looking north, Aspinwall Ave. follows the fence to the right. The great elm which came down in 1863 still stands. The front entrance is in an older configuration and the extended rear of the house has not been removed yet. The remains of the great elm tree, toppled in 1863, remain. The rear of the house has been reduced, this may have occurred as a result of the widening of Aspinwall Ave.
At the site of the present-day Ward Park on Aspinwall Ave. Great elm tree is gone. Aspinwall House is on the far right, torn down 1891. St. Paul St. looking north to the left, Aspinwall Ave. to the right. Before 1891. Note two children peering from middle window. Fence going along the rear of the house has been removed and new one going down the backyard has appeared. Flag pole installed on top of house. 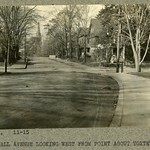 Aspinwall Ave. to the right, looking east; St Paul St to the left. 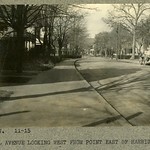 St. Paul St. at Aspinwall Ave., Looking Southwest Toward Harvard St.
Circa 1915. 79 Aspinwall foreground left. Note horses getting water at the pump with an early automobile in the background. Looking east from Harrison St. 194 Aspinwall Ave is the first house on the left. Looking west. Horse-drawn cart is in front of #194, Harrison St. comes in after that. 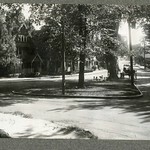 Looking west just before Toxteth St. #168 Aspinwall Ave. is the first house on the right.